Welcome to Mockingbird Press' first monthly blog article. To launch it, we thought we’d take the opportunity to wax lyrical on one of the more exotic artistic mediums we’ve seen recently. 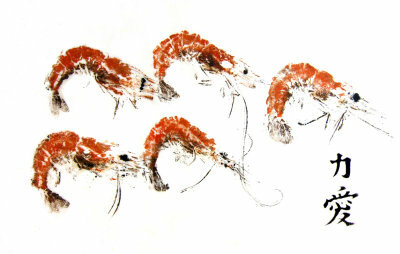 So, Laura, can you describe the very basics of how a fish or a prawn makes its way onto one of these prints? First, you have to make sure the fish is fresh, clean and dry. 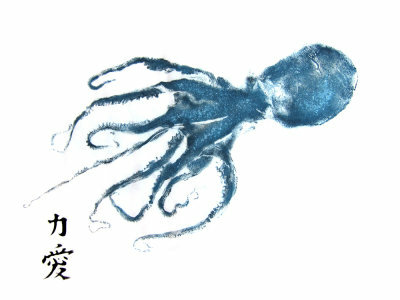 You then ink it up using several layers of oil or acrylic ink, then place a sheet of rice paper on top. I have bought many of these fish at Smithfish on North View. They are very helpful and interested in the process. I’ve also had some straight from a fisherman in Dorset who was fascinated by the idea. Choosing them is great! I look for a fish that is fresh and in good shape, while making sure the cut is not too big so the fish doesn't distort. I’m also interested in the scales and texture, as that is what my print will pick up. This technique seems extremely unusual, yet it feels highly traditional somehow; can you comment a little on the history of it? I did a collagraph course at Spike Print. 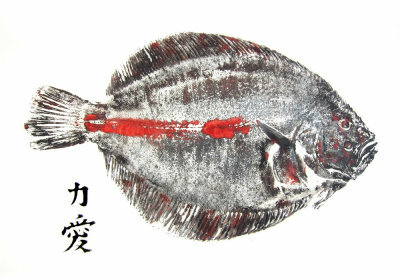 Ash- who was teaching the course- mentioned printing from fish, which I had long wanted to try. I bought a large Brill, brought it along, and he was delighted to have a chance to print such a big fish. 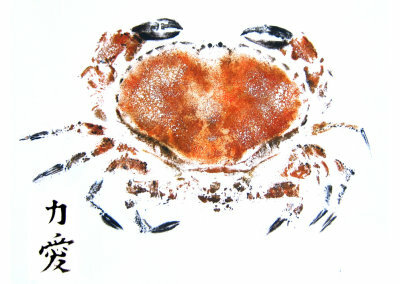 He showed me the rudiments of the process, and then found out that it was called Gyotaku printing. We both researched the process, and found that it is a traditional Japanese technique used by fishermen to show off their catch. That’s pretty fascinating. Now, were there moments during your early attempts where you thought, ‘this is difficult’? To begin with, I thought that we would be inking the fish and then laying it onto the paper, but we found it difficult to control this way. The most difficult printing was from an octopus; trying to control inky tentacles was a nightmare, until I devised a way of avoiding moving them after inking. That sounds like something you can laugh about in hindsight! Do you have any advice for people interested in attempting this printing method at home, perhaps using slightly less slimy muses? I have printed in this way using vegetables, and they work well. You just need a large clean workspace, rice paper, good quality inks, and lots of patience! We appreciate the insight, Laura. So where can people find your artwork? My work is currently on show at the Hidden Gallery, Clifton Arcade, and will soon be on show at the A2 Gallery, Wells. I will also be selling these prints at the BS9 Arts Trail on 14/15 May at St Monica’s, and again at the West Bristol Art Trail 15/16 October at Holy Trinity Church. And can we put in a personal request for a turbot? With chips and peas, or...? With thanks to Laura Howarth, we conclude our very first Mockingbird Press blog entry. Please don’t hesitate to join in the conversation on our Facebook page or Twitter feed, and keep an eye out for the next blog piece in a few weeks. Forthcoming entries may contain some interesting information for some of you. Now how’s that for tension?